Finding inspiration has never been a problem. The problem is finding time to do all of the wonderful things that I want to try out. This project is one that has been sitting in the back of my mind for two years at least. 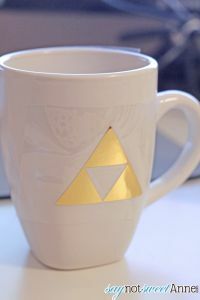 I can’t remember where I first saw it, but the concept stuck: does iron on vinyl stick to ceramic? Is it top-rack safe? How about the microwave? So it became clear to me. NOW is the time to do this project. With V-Day right around the corner, hubby needs a new mug and I’ve got just the thing. 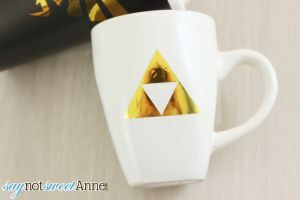 I tried a few different vinyls and methods and this is what I came up with for using iron on vinyl on ceramic. Ceramic Mug. Try and choose one that you can get a good ironing surface with. My first attempts were square at the bottom and round at the top. That left a lot of weird angles that I couldn’t iron on very well. Also, something with a bit of a matte finish takes far better than really glossy ceramic. Iron On Vinyl. I’ve found that glitter vinyl is hit or miss. Some of it comes with a very heavy glue layer that smudges around when on the ceramic. My favorite was a nice thin gold foil. Cutting Machine, punches, scissors, or knife to cut out your iron-on design. Iron. There is such a thing as a craft iron. Its smaller and more easily maneuvered. If I begin making these with any regularity I will invest in one. My large iron was difficult to hold on to when working with small pieces and a round surface. Towels to support your design. Old t-shirt or cotton rag to iron on over the design. First, create your design and cut it out however you are most comfortable. Most iron on vinyls have a clear sheet that you remove excess vinyl from to leave only your design. Do that and trim your sheet to about 1/2 inch around your design. Clean the mug really well to remove any oils. Use rubbing alcohol, nail polish remover, acetone, or even just hot soapy water. Make sure its 100% dry before you begin. Use the towel to create a “nest” for your mug. This way it won’t roll around on you, and you are a lot less likely to burn yourself. Heat your iron to the setting indicated by your vinyl – mine was “cotton”. Now, cover your design with the rag. I find this helps distribute the heat evenly. Take your time and repeat your 30 second sections, this time moving your iron back and forth or in circles, pressing down firmly. Let the mug cool. Peel up a section of the backer. If any vinyl comes away with the backer, repeat steps 5 and 6. Once the backer comes off clean, check the design with your fingernail and see if anything isn’t quite secure. Pay special attention to small areas (like sentence punctuation or tips/tails of graphics). If anything moves, replace the back and repeat steps 5 and 6, concentrating on that area. 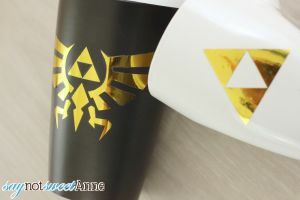 If desired, you can hit the finished mug with a heat gun, going over the design from a good distance (4 – 5 inches) slowly, until the mug and the design are too hot to touch. In my experience, this helped seal some of the more troublesome areas. Done! All of the mugs I made wash well in warm soapy water by hand. I’ll be updating the post once I am brave enough to try to top-rack of the dishwasher. 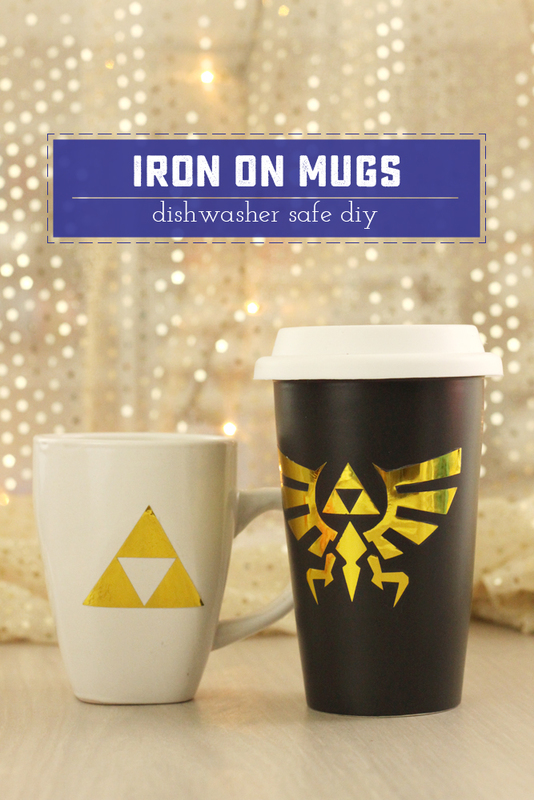 Update: This iron on vinyl mug is top rack dishwasher safe so far! Curious, did you ever try it out in the dishwasher? Can I just use a heat gun or does it have to be ironed on first? Hey Lori! I’d bet the heat gun alone might work too! Another commenter noted this, but did you ever try the dishwasher test? You mention that you wanted to see if it was top rack safe in your introductory paragraph, but never mentioned it elsewhere. If you used metallic or glitter vinyl in the microwave, that could be why it sparked. Most people know not to put metal in the microwave due to sparks, but in my experience some metallic colours can do the same. A plain vinyl could possibly be fine. Thanks for the tip, Nicole! I’ve got it on my docket to try again with a plain vinyl. hey kayla! that iron vinyl ceramic vinyl cup is so good to see! Vinyl coffee mugs are love 🙂 With a custom message on them. . BOOM! I know RIGHT!? I ended up making 12 or so for the teachers at my son’s daycare. I LOVE seeing them in the morning with their adorable cups! 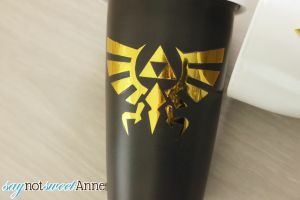 After using the vinyl on the mug can you use a sealant for extra protection from peeling? Hey Wanda! You sure can. There’s a dishwasher safe Mod Podge (that requires 30 days to dry) that I’ve used and I know some people who use an epoxy resin to seal it instead.